It is the ultimate sign that it’s time call an Quality Air Heating and Air Conditioning specialist: your air conditioner is blowing warm air. There are several reasons why your air conditioning system can start to blow warm air; we’ll explain below some of the more common reasons we’ve seen this happen with our air conditioning customers in Columbus, OH. The refrigerant in your air conditioner stays at a consistent level; it does not get used like fuel in other mechanical systems. It also has to be at an exact level; every air conditioner has an exact amount of refrigerant it needs to operate properly as mandated by the manufacturer. Your air conditioner is a closed system, so if your refrigerant becomes low, there are only 2 reasons this happens: either the original amount injected into your system wasn’t enough, or you have a leak. In either case, a low refrigerant level means your air conditioner cannot work the way it should – in particular, the heat release and cooling process – which is how your air conditioner can wind up blowing warm air into your property. Refrigerant leaks get worse the longer they stay unrepaired, so if you suspect a refrigerant leak, call a professional. The fans in your air conditioner are very important for air flow and assisting with heat release from your system. When one of the fans is not operating correctly, the air flow becomes constricted, affecting the heat release process. As such, your system cannot cool properly and warm air gets blown back into your home. Repairing fans can be tricky work, particularly the wiring inside the motors. If your fan is malfunctioning or not turning at all, call a technician to inspect it. Obstructed ductwork and/or bent fins on your outdoor unit can have a similar effect as a malfunctioning fan: reduced air flow. You may still feel cool air coming from your system, but the amount of cool air blowing into your property may be seriously decreased. No one wants to feel warm air coming from their air conditioner. The real heat hasn’t hit us yet in Columbus, but it is on its way. 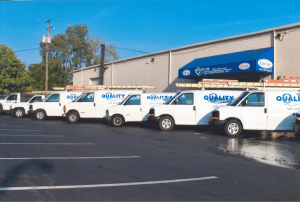 Even if you don’t feel a difference in your air temperature, but suspect there may be an issue happening with your AC, schedule a service appointment with Quality Air Heating and Air Conditioning to review your air conditioning in Columbus, OH.